Olivia has a new corkboard in her room and I wanted to make some pretty thumbtacks for her. Her favorite color is blue, so I made her a set of thumbtacks. These are an extra set I made for my shop, Harvest Moon by Hand. I made fabric-covered buttons and then affixed them to a tack. They are 3/4″ metal buttons covered with 100% cotton fabric. More sets of thumb tacks will be added soon. 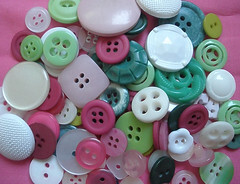 My daughters and I have been enjoying making fabric-covered buttons recently. These are four buttons that I recently made from two different cotton fabrics. They would be good for replacing plastic buttons on clothing, as special embellishments for a knitted or crocheted item, crafting, or for pontail or clip holders. This set, as well as other sets of buttons, are available in my shop, Harvest Moon by Hand. Went through my button jars and created this melon-inspired button collection in pink, green, and white that’s available in my shop, Harvest Moon by Hand. The colors remind me of summer, watermelons, and picnics. With over 75 buttons to choose from, you could use them for a variety of projects: sewing, quilting, ATCs, ACEOs, scrapbooking, art journaling, jewelry…the possibilities are endless. There are so many ways to use buttons in math. Having something tangible…something a child can manipulate…can make all the difference in helping introduce a new concept or comprehending a concept with which a child is struggling.